Shared Infrastructure of Both States Requires Coordinated Security, Communications and Intelligence-Gathering to Protect Public Safety, Assets and Commerce. Albany, NY - September 24, 2014 - Amid new global responses to the threat of international terrorism, Governor Andrew m. Cuomo and Governor Chris Christie today adopted protocols under which New York and New Jersey will immediately begin coordinating intelligence-gathering and information-sharing to defend our residents and bi-state transit infrastructures against acts of terrorism. A Memorandum of Understanding signed by the Governors comes nine days after they held a top-level security meeting in New York with national, state and local law enforcement and security heads to begin mapping out an improved, coordinated anti-terrorism plan. The bi-state agreement to substantially increase security at transportation hubs and critical infrastructure in the metropolitan area is effective immediately. 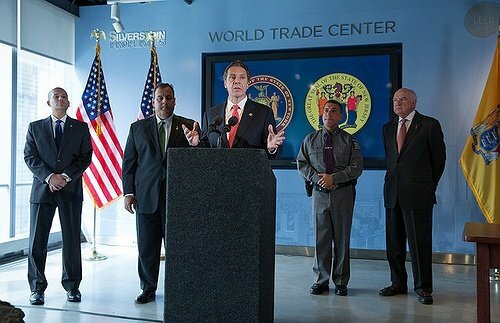 Over the next 100 days, a surge in law enforcement and military personnel will join forces within the metropolitan area to engage in counterterrorism operations by increasing visibility, inspections and surveillance on and at trains and train stations, airports, landmarks, and bridges and tunnels. Additionally, New York and New Jersey will participate in a joint emergency exercise in the coming months and continue to evaluate methods for increased intelligence and emergency coordination. The Governors said the MOU sets the path for delivery, within 30 days, of a classified analysis and coordination plan between New York and New Jersey, as they first announced on September 15 with the heads of NJ/NY State Police, the U.S. Department of Homeland Security, the States’ Homeland Security Advisors, FBI, Port Authority of New York and New Jersey and New York City Mayor Bill de Blasio. The MOU signed by the Governors addresses three primary areas of coordination: Enhanced intelligence gathering and information sharing; critical transit infrastructure protection; and reciprocal law enforcement powers between New Jersey and New York. The states, their respective intelligence fusion centers and Homeland Security directors will conduct an assessment of the tools, technological capabilities and any gaps that may exist to improve situational awareness and increase each state’s ability to adapt and respond to real-time, actionable threat intelligence. They will expand their intelligence exchange programs and plan for a rotation of analysts between their respective fusion centers. Protections of critical transit infrastructure – Port Authority bridges, tunnels, ports and airports – will be increased through law enforcement deployment, visibility and security inspections (outlined below). The MOU requires immediate planning for the joint undertaking of tabletop and full-scale exercises. The State of New Jersey is under standing Executive Orders which permit law enforcement from the State of New York to operate in limited bi-state transportation contexts within the State of New Jersey. Immediately subsequent to the signing of this Memorandum of Understanding, the Governors of each state shall explore feasible expansions of these authorities, including reciprocity for New Jersey law enforcement to operate in New York in similar limited circumstances. The Port Authority shall increase and regularly evaluate PAPD coverage at its airports, bridges and tunnels, Port Authority Bus Terminal and George Washington Bridge Bus Station, PATH, World Trade Center and ports by deploying PAPD resources, increasing the frequency of security checks and visibility of PAPD presence including bag checks, on- and off-train checks, Emergency Service Unit patrols, K-9 patrols, vehicle checks and counter terrorism and counter surveillance efforts and such other actions as the Chief Security Officer shall determine from time to time. Two-hour bag checks for PATH, increase in bag and train checks. Numbers of bag checks will be recorded. Extended on- and off-train checks PATH. Numbers will be recorded. Emergency Service Unit directed patrols, visible with heavy weapons, mornings and afternoons daily. JFK ESU truck, directed patrols. K-9 directed patrols, visible mornings and afternoons daily. PAPD to maintain heavy weapon visibility; curb side, interior, exterior and ramp side at El Al at JFK and EWR. Vehicle Inspection truck checks, at various crossings, visible during am and pm rush hour. CIB to deploy two additional counter surveillance detectives, mornings and evenings daily; specific to PATH, PABT, WTC, and crossings. Added additional patrol car for LGA, high visibility checks, days and afternoons. PABT add two high visibility posts mornings and afternoons. Counter Terrorism Unit at PATH to conduct surges at various stations. Increased mobilization drills at PA facilities in both States working with NYSP, NJSP and Federal and local partners. The National Guard's Joint Task Force – Empire Shield will surge up to two times its current strength, totaling up to 500 military personnel. The Task Force will closely and visibly work alongside the NYC Police Department Counter-Terrorism unit, AMTRAK Police, and various other city and state law enforcement agencies. The New York State Police will assign dozens of State Troopers to train platforms and on the trains themselves, which has only been done sporadically in the past and never at this level. Additionally, in conjunction with the MTA Police Department, State Troopers will police the Port Washington, Hempstead, Long Beach, West Hempstead, Babylon, Montauk, Oyster Bay, Port Jefferson, Ronkonkoma, Far Rockaway and City Terminal Zone branches of the Long Island Rail Road and the Hudson and Harlem Line of the Metro-North Railroad. The New Jersey State Police will: redeploy aviation and marine assets to secure critical infrastructure, bridge crossings and mass transit hubs; increase the deployment of troopers in collaboration with partner local law enforcement agencies in support of Intelligence based THREAT details; and increase deployment of Mobile Overt Deployment teams to increase visibility of specific critical infrastructure. The MTA will increase uniformed officer presence by 30-50 percent at high volume stations, increase its random bag checks, increase perimeter checks and curbside sweeps at stations and terminals, and monitor security video of high-profile locations throughout Long Island Rail Road, Metro-North Railroad, New York City Transit, Bridges and Tunnels, and Lower Manhattan Security Initiative command centers. The New Jersey Transit Police will increase uniformed law enforcement visibility at train, bus and light rail stations, and increase K9 deployments, random baggage inspection and train order maintenance sweeps. Agencies participating in the bi-state security group include: the New Jersey State Police, the New Jersey Office of Homeland Security and Preparedness, New Jersey Transit, New Jersey State National Guard, and Emergency Services, the Port Authority of New York and New Jersey, the New York State Police, the New York Police Department, Metropolitan Transportation Authority Police, the New York National Guard, and other law enforcement and public safety agencies. The multi-agency group is working in conjunction with the FBI's Joint Terrorism Task Forces. Subject: LongIsland.com - Your Name sent you Article details of "Governors Cuomo and Christie Sign Bi-State Memorandum of Understanding to Increase Security for New York and New Jersey"